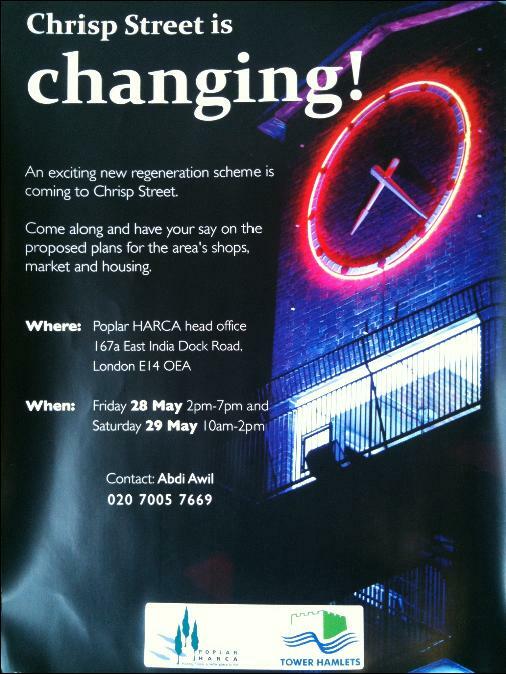 Transport For London seem to have put the mockers on Poplar Harca’s plans for Chrisp Street Market. Residents and Traders alike who I have spoken to feel as if they have been left out of the Consultation process. Talking to ‘Abdi Awil 0207 005 7669’ at Poplar Harca whos contact details were left on the flyer above, stated that they only leafleted ‘Lansbury South’. I argued why were ‘Lansbury West’, ‘Lansbury North’, Brownfield, Teviot, Aberfeldy, and the rest of Poplar and the Isle of Dogs not notified, when this is their main market as well. I asked how many homes had been leafleted and he didn’t know. Abdi, who until last week was a resident board member of Poplar Harca’s Devons Estate Board & also a member of Harca’s Finance & Audit Board is now a fully fledged employee of Poplar Harca, employed as the ‘Projects Facilitation Officer’. As a result of his employment last week, I would imagine that he would have had to resign from his post as a member of the ‘Finance & Audit’ board. These flyers were only given to Traders in Chrisp Street this Tuesday 24th May, for an event this Friday (tommorow) 28th May, and Saturday 29th May. Walking around the market I noticed only 3 flyers in the Market. One in the charity shop, one in the card shop in vesey path, and one in the Pie & Mash Shop next to the Harca office on East India Dock Road. No where else did I see any other flyers, not even in the most used places in the market, the Post-Office & the Chrisp Street One Stop Shop (More on this later). Anyway I feel Harca owe it to the residents of the entire area of Poplar to keep them fully informed of events regarding their only market. With regards to TFL, sources within the traders commitee who met last night with the Architects & Poplar Harca representatives tell me that all plans are now on hold as ‘Transport For London’ have put in an objection. Apparently its regarding one of the access routes, and thats all they knew as no-one would be pushed on it. They went on to inform me that the ‘Evaluation Meeting for the 28th June has now been postponed indefinitely. I asked about the new ‘Projects Facilitation Officer – Abdi Awil’ and they stated that yes they knew who he was but that he had sat silent the whole meeting taking the minutes of the meeting. Not a bad job for such a fancy job title.